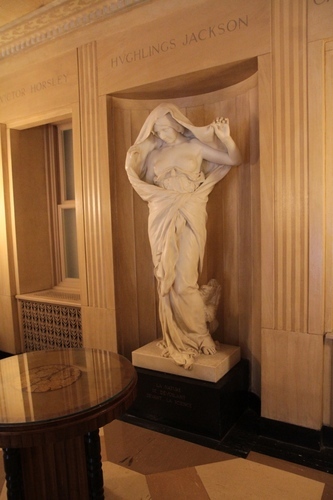 The main feature of the entrance foyer of the Montreal Neurological Institute and Hospital in Montreal is "the elegant marble statue of a woman identified by the legend La Nature se dévoilant devant la Science (Nature unveiling herself before science)"1. It is a copy of 1899 Ernest Barrias's famous statue in the Musée d'Orsay of Paris2. Another copy can be seen at the base of the main staircase inside the old School of Medicine of Université Paris Descartes. "Penfield wrote to his mother on 17 July 1932, 'I have always longed for a copy. The other day in Cleveland it occurred to me, as I was walking down the street, that we might have a copy made and placed in such a position in the entrance that it would suggest to one entering the ideal I have in mind for the whole Institute'"3. 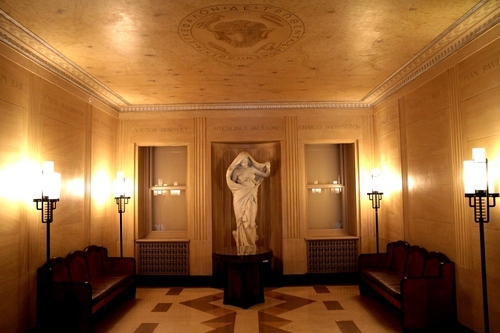 "High on the walls of the foyer are depictions of the ventricular cavities of the brain and a frieze listing the names of famous neurologists (…): John Hughlings Jackson, who had such a formative influence on Penfield's thinking; Sir Victor Horsley, the first neurosurgeon; and Nobel laureate Sir Charles Sherrington, Penfield's Oxford mentor, represents the British Isles. Sherrington is joined by two other Nobel laureates, the histologists Santiago Ramon y Cajal and Camillo Golgi. The French school is represented by Jean-Martin Charcot, for whom the first chiar of neurology was created, and by Claude Bernard, the first proponent of experimental medicine. Wilhelm Erb, Franz Nissl, and Alois Alzheimer represent the German contribution to neuroscience, while Constantin von Monakow and Ivan Pavlov represent Russia, and Silas Weir Mitchell and Harvey Cushing represent the United States. Wilder Penfield joined them (…) when the lobby was renovated after his death. Thomas Willis, the Oxford physician who coined the name neurologist, was also added, next to Penfield's name"4. "The foyer ceiling is decorated with frescoes depicting the neuroglial cells within the cerebellum, as they appear under gold and silver stain and as they lie within a background of neurons and blood vessels. 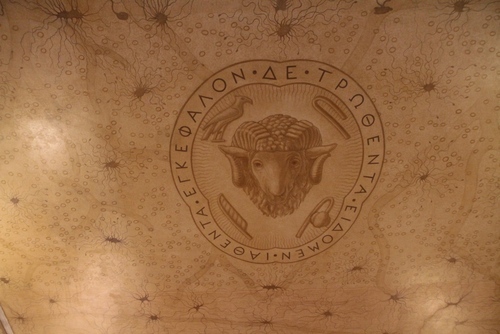 It is on this realistic background that the ram appears, as a metaphorical reminder of the goal of the MNI"5. 1. Feindel-Leblanc 2016, p. 83. 2. See the Museum's official website. 3. Feindel-Leblanc 2016, pp. 83-84. 4. Feindel-Leblanc 2016, pp. 85-86. 5. Feindel-Leblanc 2016, p. 86.